I recently had to return to England over Christmas, I say had to, I was happy to go of course. It’s been over 3 years since I returned home to New Zealand from my 20 plus years living in England. I was interested to see how it would look as a visitor, rather than a resident. I took my camera. What England mostly looked like, was foggy, although we did have a sunny day, so that was nice. Images in no particular order. St Paul’s with Blitz memorial statue. Looks like a Russians outing. Not sure it isn’t. Corner of Frith and Old Compton Street in Soho. Spent many good nights round here. Standing on top of the Tate Modern Art Gallery. I decided to try my hand at making some modern art, I didn’t have any crayons though, so I used my camera. I expect the Tate Modern will be in touch any day to ask if they can hang this in the foyer of the gallery. People having a modern art moment in the boiler room of the Tate Modern. Looking West up the Thames. Man blowing fire out of his Tuba, as one does. Air traffic over Big Ben. I got up at Sparrow fart to have a poke about in this cemetery in Bath. I was taking a photo of this characterful book shop when some urchin parked their bike in my shot. Liz and Phil’s, they’re not home. Castle Coombe, no racing in this bit. I believe the four legs on the plinth means something, don’t know who he is either. Above Horse Guards parade ground. Highbury Fields, on the sunny day. London, not Moscow. St James’s park. Who doesn’t like a nice ornate building. This is Horse Guards parade ground in front. History fans will know what that building is. So not the usual touristy shots perhaps. It’s actually quite hard to take a photo a bit different to what is obviously on offer and on a million postcards. My lingering impression of my revisit to England though was that I’m very pleased I live in New Zealand. It’s good to be home. New Zealand is a long but fairly narrow country. It’s 2,086 kilometres from one end to the other, but you are never more than 120 kilometres from the sea. What this means is that you can often see the mountains from the seashore, or the sea from the mountains. Which is nice. This gives many fetching photographic opportunities, such as these. 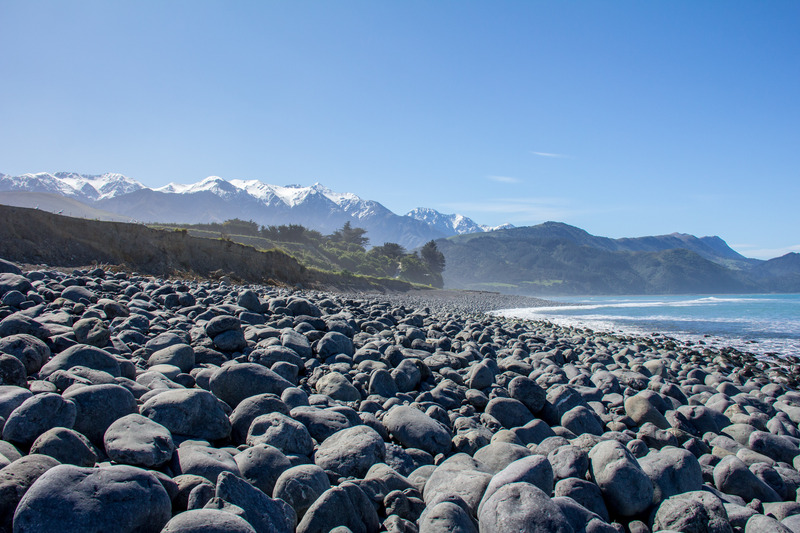 Rocky Beach, Kaikoura. It’s not the name of the beach, merely an observation. 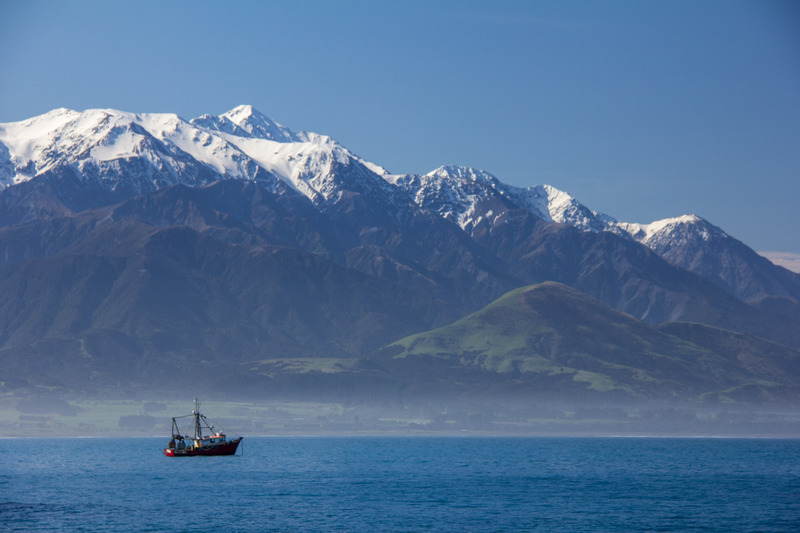 Fishing boat in front of the Kaikoura Ranges. New Zealandness at it’s most scenic, with a fishing boat. I could call this ‘Chimney Seal. You may notice a loafing seal at the base of the old chimney. 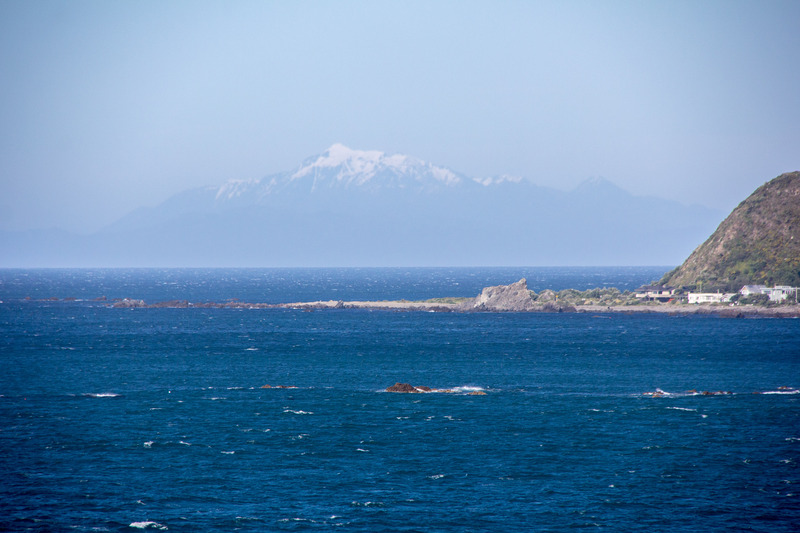 Looking across to the Kaikoura Ranges. 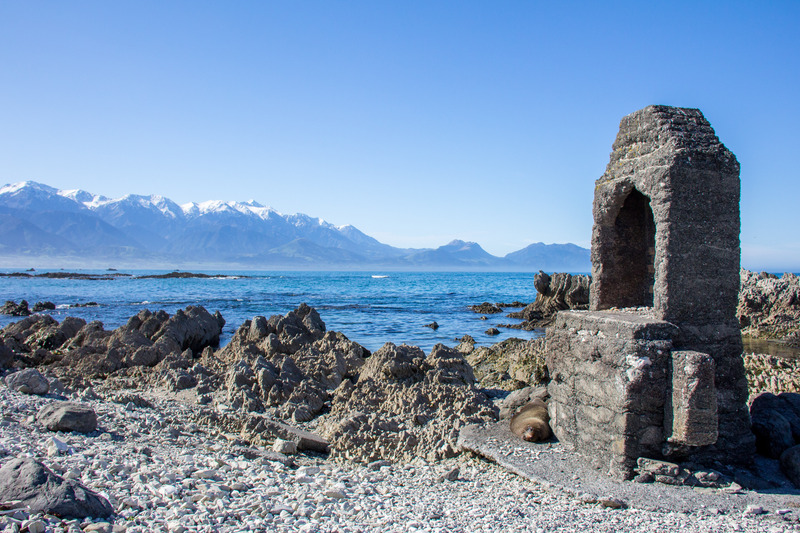 Well I am looking at the Kaikoura Ranges, the Seal is not. 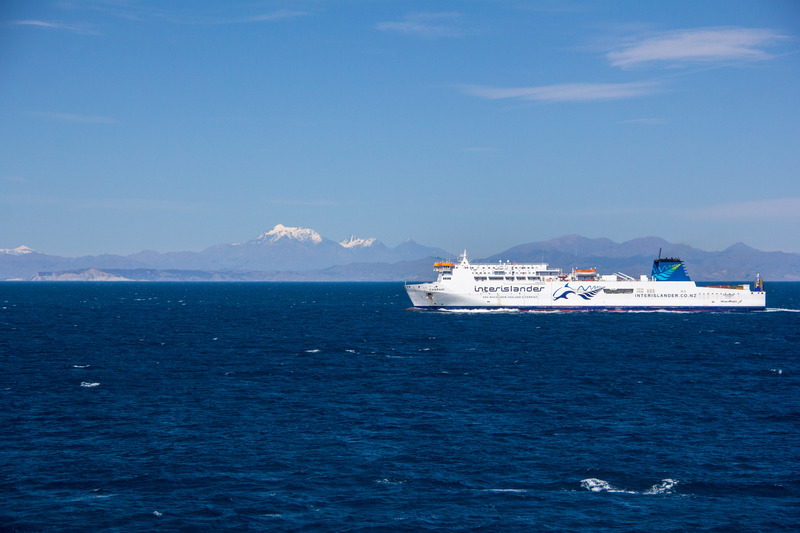 The newest Ferry in the Interislander Fleet heading North for Wellington, this is how we get from one island to another. You can fly but this a nicer way to go about it. That’s the Kaiarahi. I took this from the ferry I was heading South on, towards Picton. 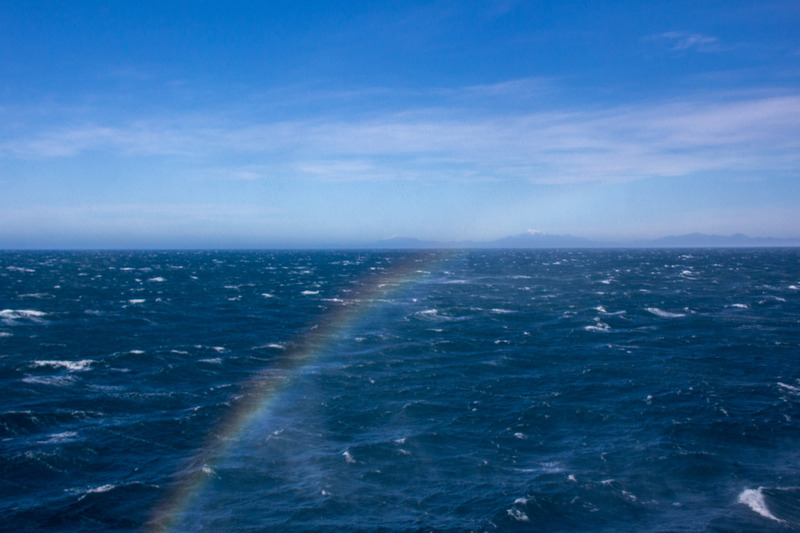 On a rough crossing in Cook Strait, the large bit of water between the North and South Islands you sometimes get these sea spray ‘rainbows’. You have to be quick to photograph them as they come and go. Plus you risk a salt water soaking of your camera. You decide if it’s worth it. 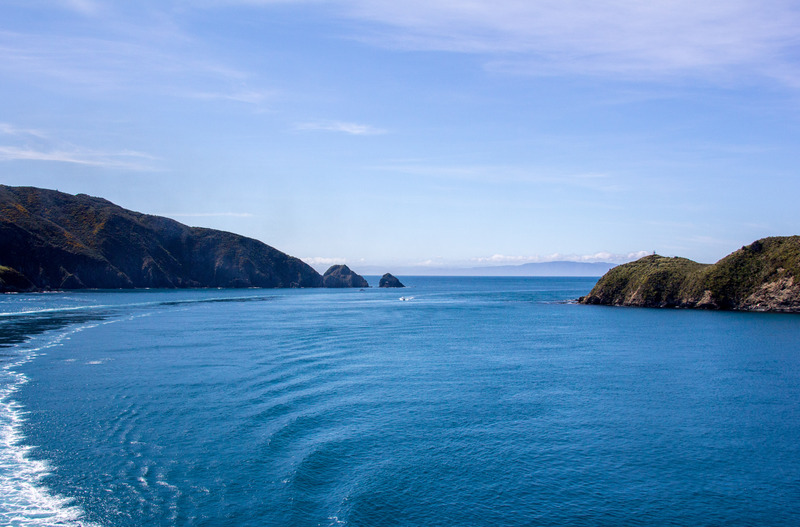 After a rough crossing of Cook Strait, turning into the Marlborough Sounds through the Tory Channel is like walking into a library off a busy street. A giant outdoor nature library on a sunny day sort of thing. 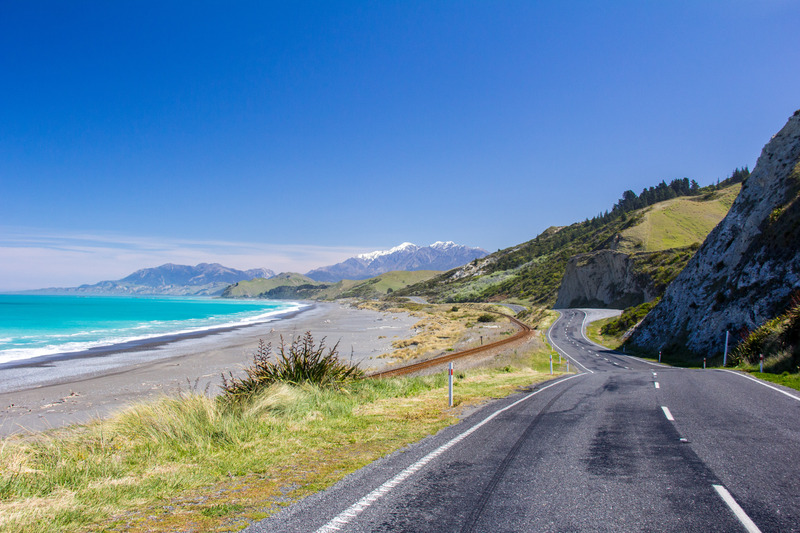 Once you’ve left the ferry in the South Island, the main road South is this one. That’s New Zealand’s main road. State Highway One. The rail line beside it is the main rail route south. This is how we get about. 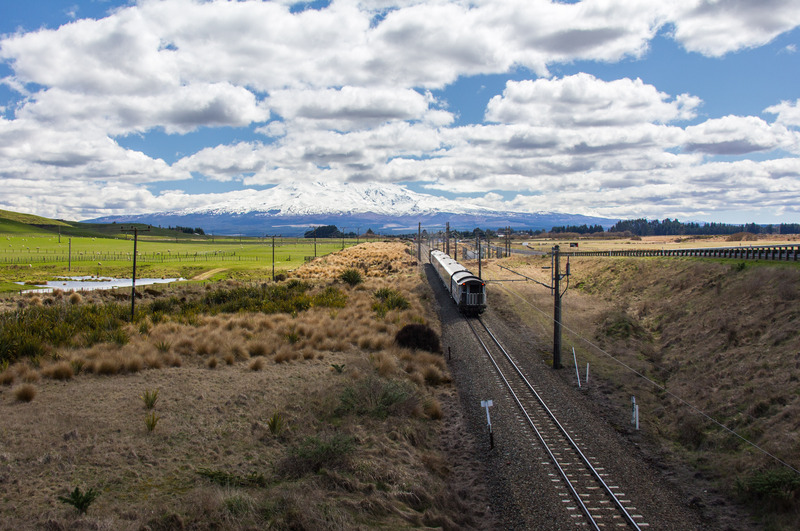 Taking the Train in New Zealand is slow but scenic, this is the ‘Coastal Pacific’. I reckon Kiwi Rail named the train ‘Coastal Pacific’ because it follows the Pacific Coast but I’m just guessing of course. 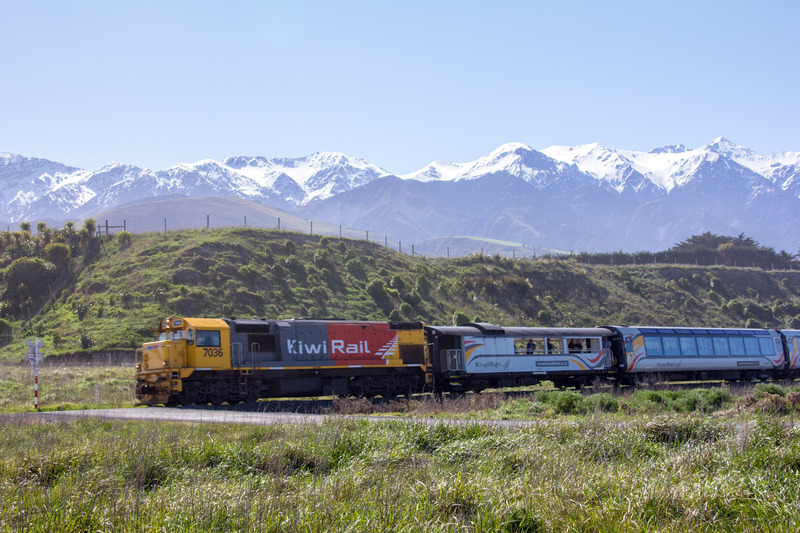 On the subject of trains, This the train that runs up and down the North Island. Kiwi Rail creatively named this one ‘Northern Explorer’. I can’t think why though. In the title of this post I made reference to mountains and that’s the biggest one in the North Island. Mt Ruapehu. It’s quite far from the sea. Inland, far inland. But still less than an hour’s drive to the ocean if you head West. 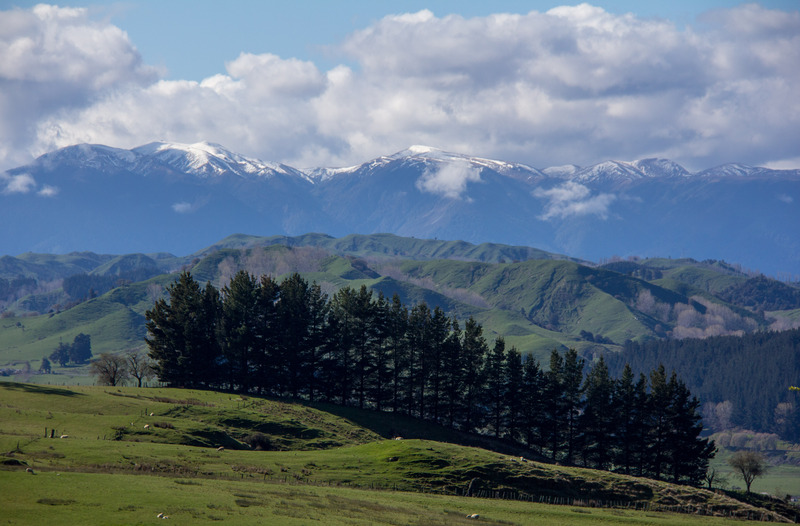 The Ruahine Ranges, on the other side of them is Hawkes Bay. 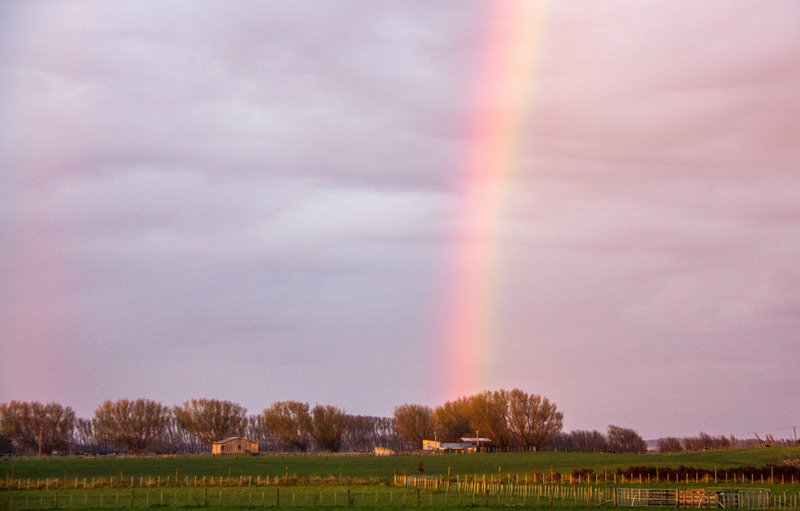 Rainbow, kicking off an early morning, inland. 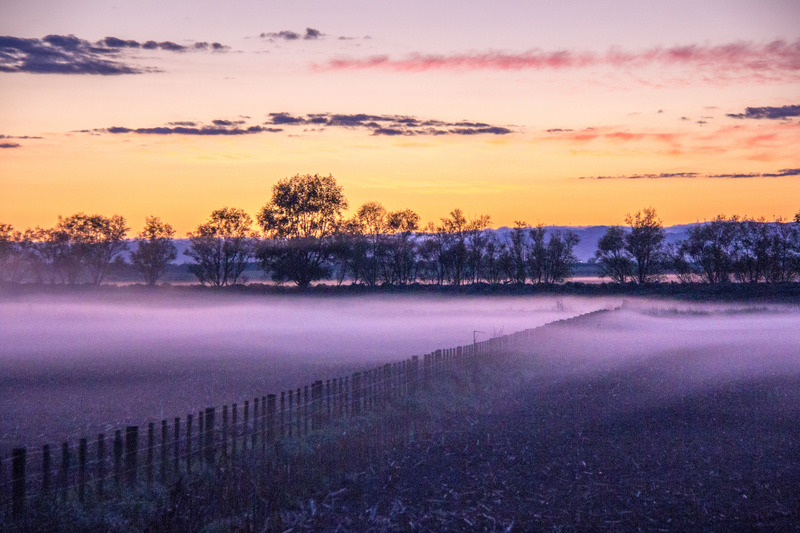 Early morning Manawatu. I drive past this sort of thing from time to time. 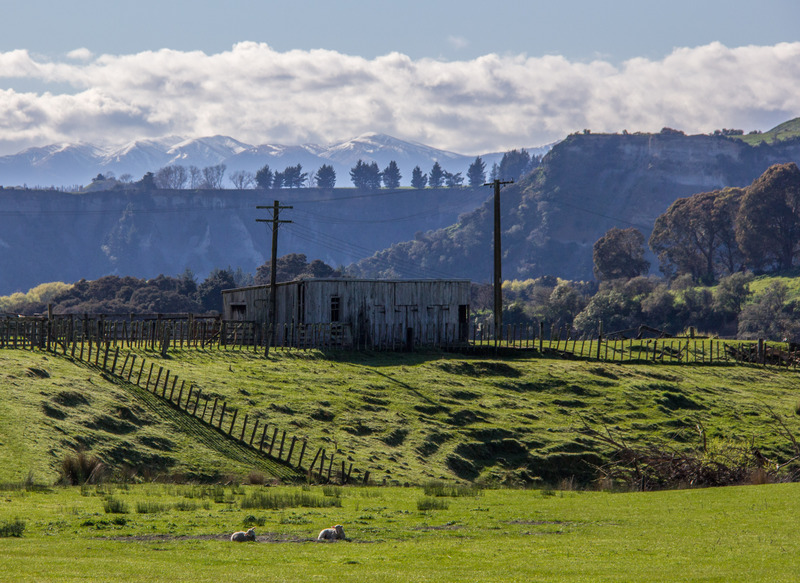 Manawatu is mostly flat, lying between the Ruahine and Tararua Ranges and the Tasman Sea. One day when I can afford better camera equipment than I have. 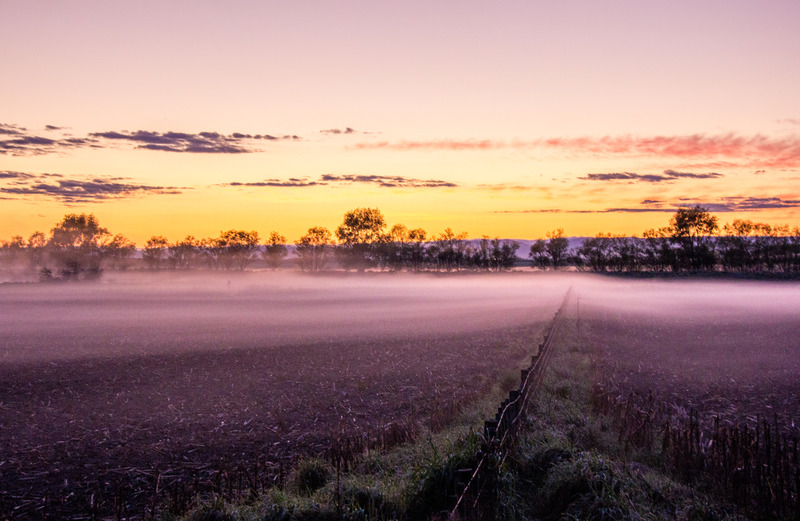 I can capture this sort of amazing early morning scene better. Between the mountains and the sea. The Mountains are half an hour drive in front of me here and the sea is 15 minutes drive behind me. 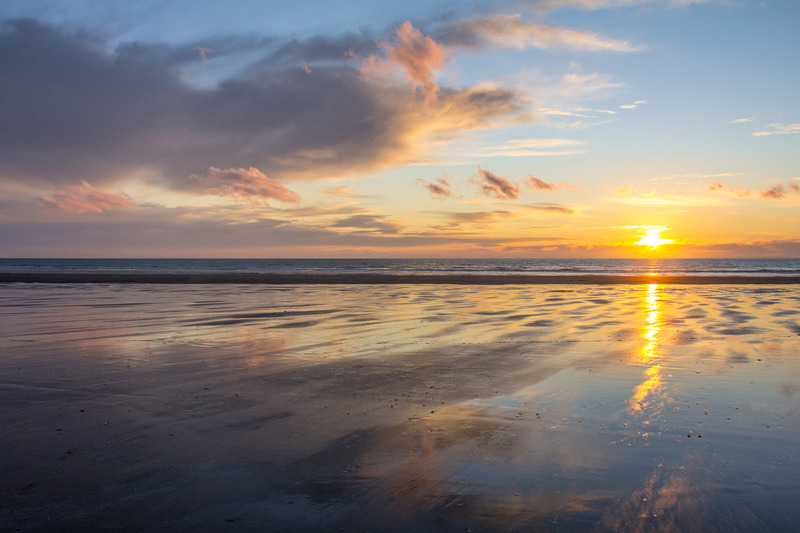 What better way to finish than with the sun dropping beneath the Western Horizon. I’m standing just feet from a public highway here and barely an hour from a mountain range behind me.